Oh, you guys. I just can't even with this new release. Anyone who knows me knows that I love to color, and all the line art on these new stamp sets just set my coloring heart aglow!! I'm not even going to drone on about how awesome the release is because seriously the products speak for themselves, so let's get to it! Don't you just love that tree? It's so stinkin' cute! And I just love that sentiment--so much fun! Makes me think that I'll send this card to a friend who will hopefully picture me standing on my porch waving to them in the form of this card! That little dog--just forget about it. The cutest ever!! It would totally be okay with me if I lived in a house on a street like this in real life! I also incorporated some of the background stamps on the Strolling Borders stamp set. I think these stamps really made these scenes come to life! You can find the entire new release here on February 13! Be sure to keep up with all the events this week because we've got more hops planned, and I've got more cards to share! Comment on each blog on the hop for a chance to win a $25 gift certificate to the Catherine Pooler store! Winners will be announced on Catherine's blog on February 18th. Thanks for stopping by today, and happy crafting! These sweet little house cards are adorable! I am loving the bricks and cobblestones too! Kelly, so much fun and your coloring is awesome. Such cute little town scenes you have created. That border stamp set will be a must have. I love how all the sets coordinate together. That is what Catherine does best! The Happy Place stamps would be great for a Welcome to the neighborhood card. Great cards! Cute cards Kelly! Great designs and fun cards!!! I thought I might get away with buying one or two stamp sets from this release, but the more cards I see the more I think I'm going to end up with the whole "kit and caboodle"! Love those houses, and agree with you that I would love to live on a street like this. Your cards are so pretty - loving the houses. Pretty cards. Very creative designs ❤. Very cute cards. The coloring is gorgeous! What great choice of colors. A lot of spilling on this blog hop today. I like the contrast of the houses it is like Boston meets the quaint little towns on the North Shore. The little town cards are so beautiful! Cute cards! I like that tree, too. I'm thinking it would go great with the bench and squirrel from an earlier Catherine Pooler release. Adorable cards! I love the houses in this Happy Place set! I can't even...your cards are soooo cute!!! Happy place and welcome to the neighborhood! Kelly your cards are awesome, thanks for sharing. Love those houses and how you've created the stone paths. Great cards, Kelly. Those houses remind me of San Francisco. This release has so many amazing stamp sets. Thanks for sharing! I love that Victorian. It reminds me of the neighborhood. I love the coloring on your cards. I am excited about the brick stamp and stone one. So excited like you are. Wonderful cards! Love your colors and designs. I’m totally in love with the design of these stamped houses, and the way you colored them was perfect. And yes, I do love that tree, lol. Very sweet! Love all the little details in this release! Awesome colouring and cards! I also loved the tree and that sentiment "you are my home" is fantastic. Thanks for sharing!!! So cute. I love the houses and that little dog❤️ Looking forward to challenging myself with coloring. Oh my! 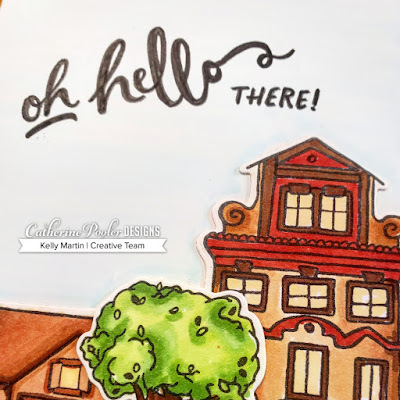 Your houses look amazing! Fantastic cards! Lovely scenes and beautiful coloring. I love architectural themes and these are fabulous. Such beautiful home cards. I love the scenes you created. Very nice. . I love your house cards, colored beautifully and the detail is amazing! Your cards are adorable and yes, that tree and dog are stinkin’ cute! Love houses. Great job, thanks for sharing. The set with the houses has so many great images. I'm glad that you can use just one house or all the houses together because it makes the set so versatile. I appreciate that you showed how you can use the brick or the stone stamps in scenes. Your houses are amazing! I always wanted a window like that second one to sit in and read books!! Happy, fun cards. You did good! I like the cute scenes you created. you create really fun and beautiful scenes. Kelly, these are great! 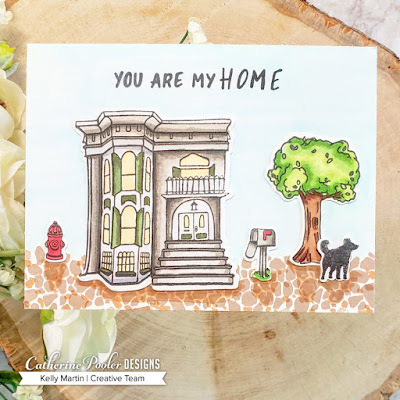 I especially love the coloring of the house on the second card. Neat cards. I love how you created the scenes using them Kelly. Amazing cards!! Love the little scenes your created!! 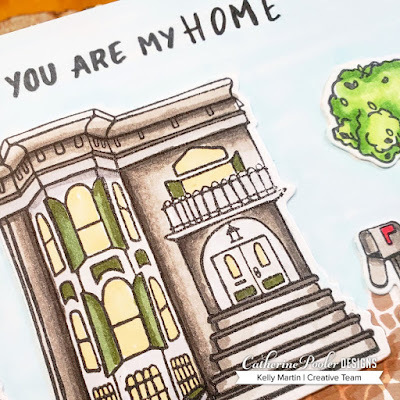 Love the homes you created! Beautiful cards. I love the painted houses. Heffy Doodle Spring Release Blog Hop!